To you and to yours I send heartfelt tidings. May your heart (and glass) be full, your children close, your season chipper and your tree tall and straight. As a lover of irony, I did a double take when I read that we ought live without. Speedboat is a fine (if ironic) book from the 70s by a great writer and rebel and it’s coming back round. 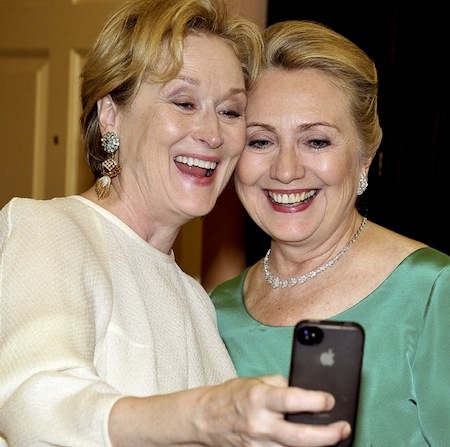 Two powerful and beautiful women laugh, shoot and play with technology. A website offers an irresistible visual and virtual tour of reading underground. 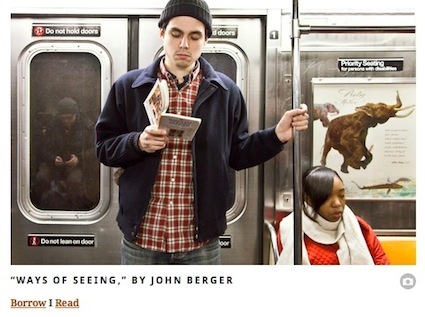 What if a search engine took us to all the cool places, people and things we find in books? Oh, you would like the perfect gift? Check. I had coffee with Voltaire the other day. After I told him my story he looked into my eyes and said, “‎Life is a shipwreck, but we must not forget to sing in the lifeboats.” I could only agree. Thanks for being here. Build yourself a great big fire, light up the tree and have yourself a warm and lovely holiday. Well. Tell us how you really feel. But what follows is important, I think. It calls on us to be better humans, more genuine and true. Sincere. 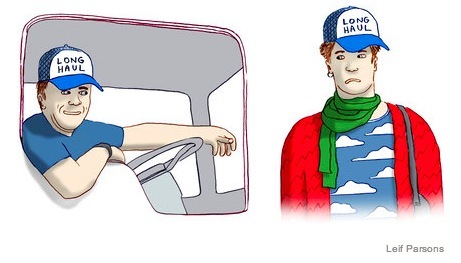 And no surprise, David Foster Wallace smartly elbows his way into the conversation. Whether or not DFWs argument for art with reverence and conviction, real feeling and sentiment was rooted in his own suffering, who can say? But reading his words only reminds us of how much we lost when David Foster Wallace took his leave. Snark and ironic detachment are difficult to hold onto when you’re so truly and seriously attached to making great art and you are so unwell that you can no longer live. But what if Christy Wampole is all wrong? You heard it here first. 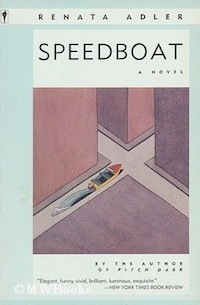 Speedboat, a 1976 award-winning novel by former New Yorker writer and bomb thrower, Renata Adler, will be reissued by the New York Review of Books. 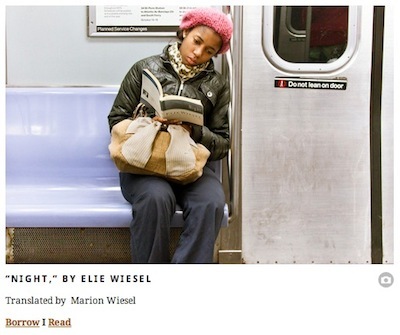 Mark your calendar for March 19, 2013, the same date that the sequel, Pitch Dark, will also be published by the NYRB. Two hot broads being true to themselves. If Helen Mirren had been there, the universe would have imploded. Of the many memorable quotes uttered by Hilary Clinton, I dig this, “You have to be true to yourself.” If Hilary becomes more beloved than she already is the sun will fall out of the sky. Fair warning. Note the “Borrow’ and ‘Read’ buttons. The screenshot below is from Small Demons. 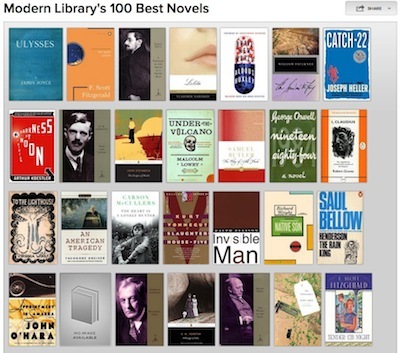 The Modern Library of the 100 greatest novels. How many have you read? You so need this. I so need this. 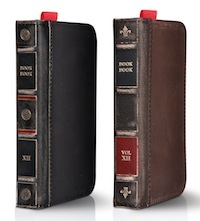 An iPhone case that thinks it’s a book. The company is called twelve south. 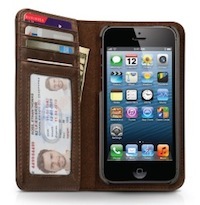 twelve south makes cases for iPads and laptops too. Apple products only, so you Android users can just move along, there’s nothing to see here. Dear twelve south, contact me and I’ll help with the copy. Here’s a snippet of the copy for all my copywriting friends. It’s workmanlike, but uninspired. 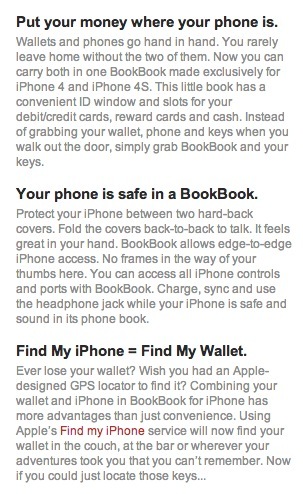 For such an uber cool product I want more than phrases like, “convenient ID window” and “slots for your debit/credit cards.” Zzzzzzzzzzzzzz. What say you? Just when you thought it was safe to go back outside here comes a summer issue of FCT. Apologies for the long absence. In this issue, Laetitia, Wislawa, Gill, Ida and Orhan. Speaking of Orhan Pamuk, this is what he wrote in Snow, “How much can we hope to understand those who have suffered deeper anguish, greater deprivation, and more crushing disappointments than we ourselves have known?” Not nearly enough, Orhan. laetitia sadier ~ she is french. Wislawa Szymborska Do you not love her face? “We could die here and nobody would ever know.” That’s Orhan Pamuk in a lively Paris Review interview. Well worth your time. destructive side to me, and in bouts of fury and moments of anger I do things that cut me off from the pleasant company of the community. Early in life I realized that the community kills my imagination. I need the pain of loneliness to make my imagination work. And then I’m happy. But being a Turk, after a while I need the consoling tenderness of the community, which I may have destroyed. Istanbul destroyed my relationship with my mother—we don’t see each other anymore. And of course I hardly ever see my brother. My relationship with the Turkish public, because of my recent comments, is also difficult. From the RSA website: “For over 250 years the Royal Society for the encouragement of Arts, Manufactures and Commerce (RSA) has been a cradle of enlightenment thinking and a force for social progress. Our approach is multidisciplinary, politically independent and combines cutting edge research and policy development with practical action.” Watch those multidisciplinary, cutting edge cliches. Sculptures – are usually made of metal and cloth. Larry creates his signature dresses out of cotton fabric and then treats the sewn shapes with any pigment available and/or suitable, from dirt to clay to ashes. The shapes are coated with beeswax and the surface is then worked until a satisfactory result is achieved, both in color and texture: a look and feel of aged leather. The surface may or may not be the base for additional clues: crude metal buttons sewn on, or photographs; sometimes transfer prints of drawings, or maybe woodcut prints directly onto the surface. Stands are made of rusted metal, welded together, each one unique and adding character to the appearance of the sculpture. Some of the dress sculptures are free standing, others are made to hang on metal hangers on the wall. The parents are full time artists with big ambitions. Their daughter grows up, has a big talent as a photographer, makes a splash, can’t seem to get past the initial splash to move into a longer term fulfilling career, and during a period of despair, kills herself. She becomes famous in absentia, eclipsing the notoriety of her parents, one of whom is not terribly happy that the daughter has taken the spotlight. This is a touching, heartbreaking, affecting film directed with a deft touch by C. Scott Willis. 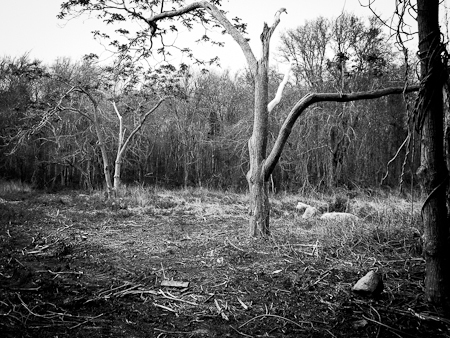 The costs of making art, the challenges of parenthood, the price of big ambitions. The score is beautiful and was written by the Pulitzer Prize winning composer, David Lang. Watch the trailer. As a general rule, good television does not often involve an adventurous game show host and an avant-garde composer-guest playing clock radios and bath tubs, but there was such a time in America when such things did take place. I love that Robert Smartwood had a brilliant idea and that he executed it so well that the world – and W.W. Norton & Company – flocked to his doorstep. I’m not sure anything gives quite the serotonin kick of discovering the work of an outrageously funny and brilliant writer. Google Docs is steadily becoming an indispensable tool of modern life, discuss. Is there such a thing as progress and if there is, how have the historically poor and sick nations of the world progressed over the last two hundred years? Glad you’re here mates. Onward. I can’t possibly think of anything to add to this. Thanks to Marbury via Alex Ross. 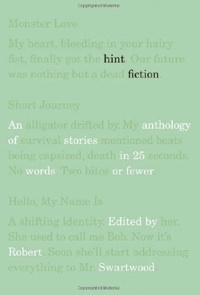 It was Lincoln who once apologized for writing a long letter by saying, “I didn’t have the time to write a short one.” Writing short is far more difficult than writing long, which makes Hint Fiction~An Anthology of Stories in 25 Words or Less, all the more impressive and wonderful. You’d like samples? My pleasure. “What’s he doing out there,” Marnie asked. We were sick of the lake, sunburned and wanted to go home. open on the nightstand so the boy would see. As promised, below is my own 25 word story. Every cell in my body felt it, knew it. Evil washed over me like a black waterfall. And I left her there. Yes, I know that Jonathan Franzen is the terrific soup du jour, but I’d also like to call your attention to a particularly wonderful special we have today. 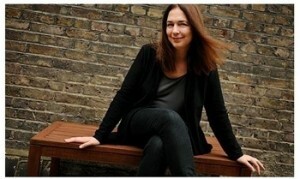 Name of Lorrie Moore. This past Christmas I wandered into a bookstore and in five seconds flat, I’d grabbed (purely on instinct and a dim memory of something I’d read) a signed first edition of Lorrie Moore’s A Gate at the Stairs, a 2010 Pen Faulkner Award nominee. Dear JM: I can’t wait either because I just finished reading her short story, People Like That Are the Only People Here, one of the most powerful stories I’ve ever read. After that I read, You’re Ugly, Too and laughed so hard I thought I thought I was gonna swallow my head. “Healthy? I just want the kid to be rich.” A joke, for God’s sake. After he was born, she announced that her life had become a daily sequence of mind-wrecking chores, the same one’s over and over again, like a novel by Mrs. Camus. Another joke! These jokes will kill you. She had told too often, and with too much enjoyment, the story of how the Baby had said “Hi” to his high chair, waved at the lake waves, shouted “Goody-goody-goody” in what seemed to be a Russian accent, pointed at his eyes and said “Ice.” And all that nonsensical baby talk: wasn’t it a stitch? Canonical babbling, the language experts called it. He recounted whole stories in it, totally made up, she could tell; he embroidered, he fished, he exaggerated. What a card! To friends she spoke of his eating habits (carrots yes, tuna no). She mentioned, too much, his sidesplitting giggle. Did she have to be so boring? Did she have no consideration for others, for the intellectual demands and courtesies of human society? Would she not even attempt to be more interesting? It was a crime against the human mind not even to try.